I downloaded Slicer and imported my DICOM file. I have a Visible Human Project CT scan of a pelvis and femurs. My goal is to print the sacrum, both illiums, and both femurs (just the superior halves) as 5 separate pieces. I was following the tutorial on cropping to create a smaller volume, but when I drag the control point down to the image from the blue window, it looks like it's _behind_ the image, and therefore, I can't see where I'm cropping. As an experiment, I tried to crop anyways with a big enough volume that I knew most of the femur would be within the cropped volume, but when I hit the Crop! button, it just displays grey or black space. Not sure what I'm doing incorrectly here. Can you post a screen capture of what you are encountering? Sometimes the crop volume box is displayed in very small size, and it can be difficult to grab the edge manipulators. I wonder if this is the problem you are having. You can see and adjust the cropping box in both the 3D window and in the slices below. 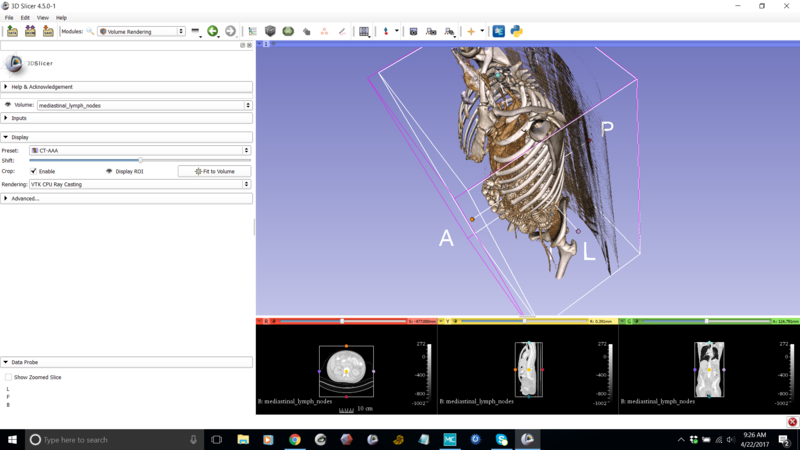 In the 3D window, you can left-click and drag anywhere to rotate the volume and box around in 3D to see the adjustable points on each surface. The box always starts out around your whole volume, but you can grab the top dot (light blue) and drag it down. I noticed that your bottom panels already have cropping boxes in them. When I used it, my bottom panels did not. According to the tutorial, you're supposed to drag the cropping box from the main "blue" screen down into the image on the bottom panel? Or is this what Dr. Mike is talking about when he says the crop box is just too small? You should not have to drag the crop box from the blue to the bottom--it will appear in all views. I've always had it show up as enclosing the whole volume. Are you able to find your crop box at all? Ah. There's the problem then. I'm not seeing the crop box at all. Make sure you check the box to "Enable" crop and also open the eye next to "Display ROI"--see the screenshots above, they're under the Volume Rendering preset dropdown. Ah...I see where things were different: The tutorial on the webpage says to select "all modules" and then "Crop volume" however, you selected "Volume rendering" which then does show me crop box on all panels. So after I do this framing, I go back to the Crop Volume to do the crop, but the resultant volume is basically all grey. Ok, you need to "open" the eye next to "Volume" up near the top to see a 3D volume and select a preset. If you still don't see it, click on the little cross-hair button at the top of your 3D window. I highlighted the buttons on your image. Ah ha... ok. So I can get to here. Do I just "Save" this? And if so, there are several options for saving: MRML, NRRD, VP and ACSV. It looks like VolumeProperty is what I want perhaps? Sorry and thanks for walking me through this. No problem! You need to go to All Modules, then Crop Volume, hit Crop and wait. Then you will see your slice windows change to the area you designated. When you go to Save, you will see that there is a second volume that says "subvolume". This is the cropped volume that you can save as .nrrd. This format can be reopened in Slicer or uploaded to the democratiz3d app to get a printable model. If there is a separation, you can click on Edit, Separate Shells in Meshmixer and it will split the model. Did you try uploading the subvolume .nrrd to democratiz3D? 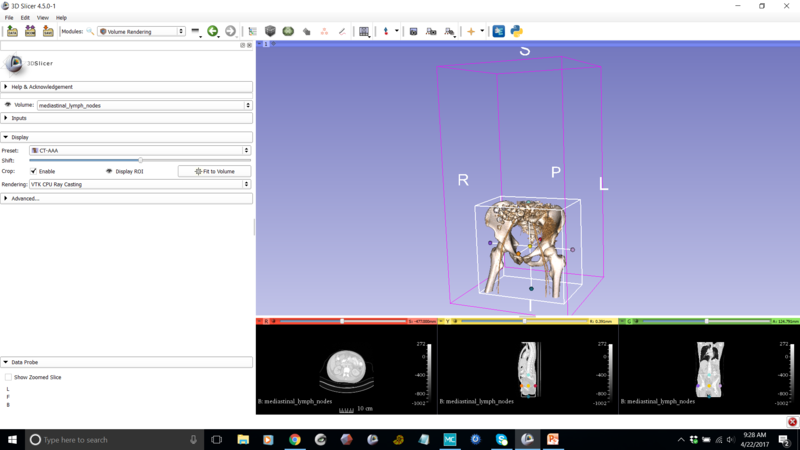 First, you can upload the subvolume NRRD file you created to democratiz3D and it will convert all the bones in the included volume into STL, including the unwanted portions like the acetabulum in your case. You are correct that they will include both the femoral head and unwanted acetabulum. The unwanted portion can be easily removed in Meshmixer. Open the STL file, use the select tool to select a portion of the unwanted object, and the use Modify->Expand to Connected. This will select everything that is connected to your selection portion, which should be the entire acetabulum. Assuming that the acetabulum is not connected to the femoral head by any mesh, you can then delete the selected mesh and the acetabulum should go away, leaving you with only the desired femoral head. A second, and more difficult approach, will be to manually segment apart the structures in Slicer and then individually export them to STL. This will require you to learn the segmentation module (not that easy). Also, when slicer exports STLs, the output STL files can have multiple mesh defects, something that democratiz3D automatically fixes. You may need to do some additional mesh cleanup after the STL export if you use this method. Terrie, thank you very much for your helpful earlier comments. I am liking all of the prior messages to give you both credit for a stimulating discussion that will surely help many other readers. Thanks Dr. Mike! I hope it was helpful!